My name is Samson J Collins and I did a Very Bad Thing. Do you remember the beautiful twisted tea time quilt that my friend Gully’s mom Dee made for my mom a couple of years ago? Well, I was snoozing in the sun the other day when I heard an awful sound! It came from my mom! It sounded like Arrrgghhh!! and then I heard her say, “Oh, Sam, what have you done?” I jumped right up and ran to investigate. I know! I’ll make amends by helping my mom out in the sewing room! Yesterday I held down the quilt sandwich so Mom could baste it. Just when I thought I was done, my Mom laid out a second, larger top to baste that very same day! I had to recruit Misty to help. This was too much quilt for one little dog to hold down all by myself! And then I supervised that darned Spooky for the rest of the day. I even swallowed my pride and held this little table runner up so Mom could take a picture. Even though it was beneath my dignity. Making amends can be so…embarrassing! Do you forgive me, Mom? Yes, Sam, I forgive you. 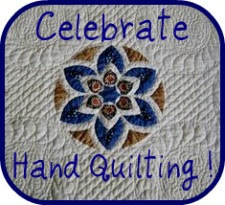 This entry was posted in Blog Categories, fabric, furry helpers, Quilts, Samson and tagged chewing, dogs, quilts, Sam. Bookmark the permalink. Poor Sam. He held your quilt really well. Oh Sam! LOL!!! I have a dog that nibbles of fabric….kinda annoying. But of course, we always forgive them! so fun to read this post again…perfect share under our “pet bed” theme at T.A. Aw…. How could you not forgive that sweet face…. This was so fun to read! Thanks for sharing Nita!